Ryan Anderson added to Optum p/b KBS' burgeoning 2015 win tally yesterday (March 8th) during the second and final stage of the UCI 2.2 ranked Troféu Alpendre Internacional do Guadiana in Portugal. The win, which subsequently brought home the overall prize in the Points Competition, marked the second and third victories on Portuguese soil since the team landed in Europe in Mid February. 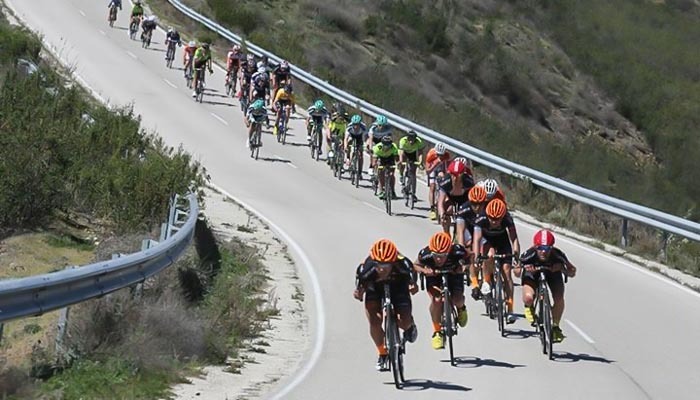 Following an impressive debut to begin Optum p/b Kelly Benefit Strategies men's season at the Volta ao Algarve and Mike Woods' win at the Clássica Internacional Loulé, the team went into this weekend's challenge seeking overall victory in the two day stage race. The first stage began with a two-man escape that was given an eight minute leash on the field. The Orange & Black were quickly isolated, having established to the other squads that they were a force to be reckoned with during this campaign. The team set about bringing back the breakaway over the remainder of the stage, just coming up 16 seconds short at the finish, where Ryan Anderson made swift work of the bunch sprint to capture third, while teammate Guillaume Boivin finished sixth after leadout duties. Sunday's approach was to reclaim those seconds and catapult Anderson into the final yellow jersey. "We had Jordi Simon (Team Ecuador) in deep trouble most of the race," reports Performance Director Eric Wohlberg. "We simply threw down all day long, however, there wasn't enough impetus from the rest of the field for us to dislodge him and take yellow." The team reset in the final 20km to go for the stage win as Boivin again delivered Anderson perfectly into the final finishing straight. Anderson took the stage while Boivin created enough of a gap over the field to hang on for third place. The result kept Anderson in third overall, moved Boivin up to fifth and also secured the prize in the Points Competition. Anderson was very pleased with the weekend's efforts despite not winning the overall prize. "The whole team was fantastic today. We rode hard all day putting the race under pressure. It was a great team effort both days and it was really nice to finish off today with the stage win. The staff and riders have all been working really hard and it shows with how well our season is starting off!" The team finished up second in the team competition for the weekend, while Phil Gaimon also finished second in the King of the Mountains competition, tied on points with the winner. The Troféu Alpendre Internacional do Guadiana marked the midway point of the Portugal race campaign. Mike Woods, Tom Zirbel, Jesse Anthony, Will Routley and Phil Gaimon return to the United States. Fresh recruits Scott Zwizanski, Brad Huff, Bjorn Selander, Pierrick Naud and Tom Soladay are on their way to join Anderson, Boivin and Eric Young, who are competing in all events. On March 21-22, the team will compete in the Volta a Costa Vicentina and then go directly to the Volta ao Alentajo on March 25-29 to conclude the series.